This chapter examines the experiences of four native English-speaking preservice teachers in a faculty-led study abroad program in South Korea. It elucidates the ways in which these preservice teachers experienced personal and professional growth with an increasing critical awareness of the power imbalance embedded in English language teaching in the global context. Data were collected via students' weekly online discussion posts, electronic portfolio artifacts, and focus group interviews. Findings indicate personal and professional growth in participants' self-perceptions as a result of at least two fundamental aspects of the program: 1) the intentionality with which participants were exposed to a critique of English language teaching in the Korean context and 2) the residential nature of the experience, which provided intensive peer collaboration among practicum participants. 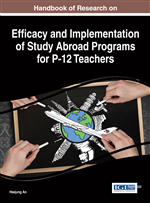 The chapter concludes with recommendations for implementing a TESOL practicum abroad as a meaningful and consciousness-raising opportunity for preservice teachers' professional development. We situate this study within the broader context of two interrelated bodies of literature: the nature of the teaching English to speakers of other languages (TESOL) practicum, and the experiences of native English-speaking student teachers in English as a foreign language (EFL) contexts. The first part of what follows examines both benefits and challenges of a TESOL practicum; the latter reviews scholarship on how a practicum abroad influences native English-speaking preservice teachers’ knowledge, assumptions, and beliefs about classroom practice. Preservice Teachers: Students in a teacher education program who intend to become teachers, but who have not yet received an initial teaching license. Native Speakerism: An assumption that native speaker teachers represent the target culture (e.g., American or British) from which spring the ideals both of the English language and of ELT methods. Community Of Practice: A group of people who share goals and interests in a domain of human endeavor, such as teaching, and engage in a process of collective learning. NESTs: (Native English Speaking Teachers): Teachers whose native language is English. Practicum: A teacher education course that offers supervised classroom teaching experience for preservice teachers to acquire pedagogical knowledge and skills. Critical Awareness: An understanding of social, cultural, political, historical, and ideological aspects of language learning and teaching in a given context. TESOL: (Teaching English to Speakers of Other Languages): An interdisciplinary field for educators who teach English to speakers of other first languages, such as Korean and Spanish. EFL: (English as a Foreign Language): English taught as a foreign language in countries where English is not spoken or used outside the classroom.